As some of you may know, I got engaged at the end of April of 2015. My boyfriend and I had always had open communication on the subject and knew we wanted a summer wedding. We weren’t concerned about a long engagement considering we had been long distance for so long. Unfortunately, a summer wedding didn’t work out so my next choice was October. “How many people should we invite? I don’t really want anyone to come. He does. If we don’t invite his family they will be offended. But why can’t we just elope? But I don’t want to deal with everyone being mad at me. Okay so just parents and siblings, But then thats five people just from his side. And then you have to invite grandparents. And can you invite grandparents without inviting aunts and uncles? What about cousins? Okay now the guest list is really big and I don’t want all those people to come. I won’t be comfortable and will just be stressed the whole time. What about a reception? If its a small number then we can just…not…right? How small is small? But if we are making people travel then we have to provide them with cake or something…Oh. Now Granny says she wants to make the cake for us. Okay, I guess Granny is invited now…” etc, etc. Anxious overwhelming thoughts went on like that for months. We never finalized the October date and lots of tears were shed and my fiance and I fought about when we would have our wedding. I knew he was taking it personally. I wasn’t trying to put it off. I wanted to marry him, but I couldn’t control my anxiety enough to take things one step in at a time. So he decided we could put it off until I felt better. School started up in the middle of August, we moved apartments and I was able to get a doctor to prescribe me a different brand of anti anxiety medication. Things were starting to improve a little bit. My fiance had finally agreed to live with me before marriage, something he had always been opposed to and I think that ultimately helped me relax a little bit. I was trying to conquer too many obstacles at once and my mind was getting overloaded. At the beginning of October, we picked a date in November on a whim. 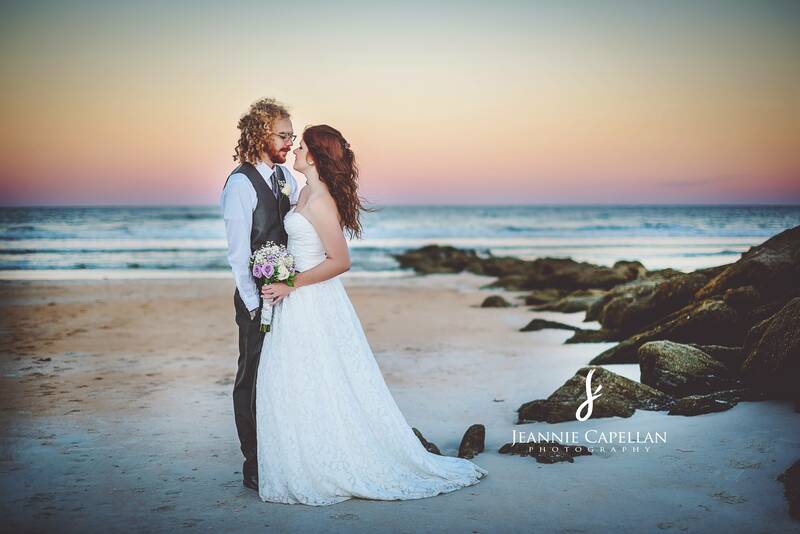 We told close family members six weeks an advance and purchased a wedding package near St. Augustine, Flordia. My mom was mildly irritating at us spending $3000 on a packaged wedding. She didn’t understand why I just couldn’t have planned the same thing myself for a cheaper price. I’m sure I could have, but I explained to her that I couldn’t handle all the planning and the stress of figuring out details was making me dread my own wedding. Not to say that a packaged wedding didn’t come with its own stress. We had a slightly unpleasant wedding planner after ours randomly disappeared on maternity leave without notice. There was an issue with billing due dates and we were stressed and having to put up half the cost of the wedding on short notice. We procrastinated vow writing, music picking, and wedding band buying – not because we didn’t want to be with each other but I think because I was putting so much stress on everything being perfect. I didn’t want to plan details but I had this notion that this was my wedding day. It was only going to happen once and everything needed to be how I wanted it because I wouldn’t be able to ever experience again or go back and fix things if it didn’t work out. That’s one of my major anxiety triggers to date. The idea that its my “only chance” to do something so I have to see everything there is to see and pick everything there is to pick so I don’t feel disappointed or regretful. The fact that this was such a big life occurrence made it all the more worrisome. Ultimately, this story ends on a good note. Alex and I got married on November 13th, 2013 at 4pm at the River to Sea preserve in Marineland, FL. It was mild with a breeze, the sky was clear and the sunset was a gorgeous mix of orange and purple. We had 12 guests in attendance. My parents, my mom’s husband, and my brother along with my husbands parents, sisters, and grandparents. Yes, we had to deal with some of his family members expressing distaste over the guest list and location and there was also an issue of a certain someone recording the ceremony even though we requested this not occur, but these issues were dealt with in a respectful manner (or brushed off) and everyone moved on. My bouquet was perfect, my dress fit, my hair that I had done myself looked lovely and it was a beautiful ceremony. All the things I had thought were going to be big issues like not knowing where to stand or what to do if I was wearing a veil and it was windy – were all simple things that came with ease on the actual day of the wedding. I pride myself on the fact that I was uncharacteristically low maintenance on my wedding day for a typical bride. My hair was kind of done on a whim because it didn’t turn out like I wanted and I was able to move on without stressing over it. I put on my fake nails the 2 minutes I had before getting in to the car to head to the beach. My dress hem was a bit too long but I didn’t trip nor did I have to walk down the aisle with my dress hiked up in one hand. My father even made it on time to walk me down the aisle. During the ceremony my veil was flying all over my husband-to-be’s face so I immediately just took it off and handed it to his mother, no big deal. I wasn’t nervous, I was comfortable and happy. My husband cried when he saw me walk down the aisle and I cried when he sang me his vows. It was beautifully perfect.